I'm kind of glad we're off tomorrow. If we weren't, I might not have gone in anyway. I'm a mess. I'm constantly sneezing, occasionally coughing and all I really want to do is enjoy a good sulk. Despite this, Toby is constantly demanding I take him our for walks. Even though he's my best bud, he clearly places his needs before mine. Today was pretty awful in the morning. It was raining, and Toby does not much care for the rain. Truth be told, I'm not so crazy about it either. The only thing Toby hates more than the rain is the red raincoat I make him wear. He's horrified by the little hood, and constantly shakes it off. When it's really bad, he will absolutely refuse to move. He wills himself to Be a Tree. That didn't happen today, though, Things were pretty clear outside by three PM, so we were able to do full walks on the Nautical Mile. I'm fascinated by that sign I pass each and every day. 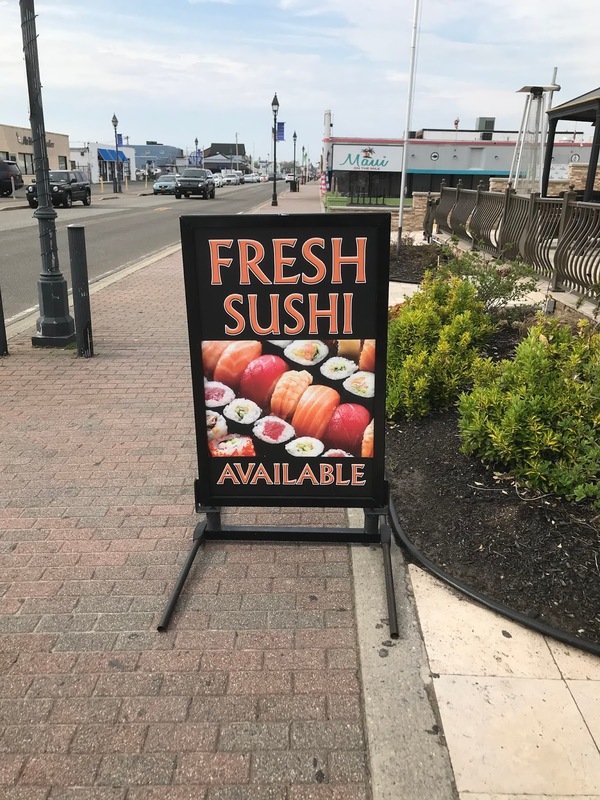 Fresh sushi available. 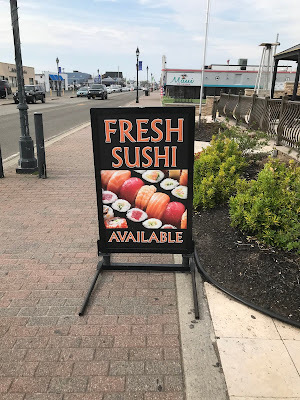 To me, that suggests they serve some other kind of sushi unless you specifically request the fresh kind, for which they surely charge a hefty premium. Otherwise, they serve you the gas station sushi they give everyone else. Are we serving fresh sushi in city schools? Not by a longshot. Forget about the actual food. We're placing kids in classes of 34, though there was actually legislation demanding we reduce them to 25. Man, if that isn't gas station sushi I don't know what is. Why is it hard for teachers to focus? Why is it hard for students to focus? Because we have a two-tier education system in this country. The pols who run it place their own kids in private schools with classes of 20 or fewer, and then they say we can't afford to help anyone else's kids. Most mornings I walk Toby all the way to the end of the canal. There aren't that many people out there at 5:30 AM. I have to take him at that hour because if I don't get to work an hour early, I will have no chance to do schoolwork. I never know what's going to happen during the day, but if I get in by 6:30 or 7 there are only crazy people like me trying to prepare before 4600 students join us. Every morning I see a man collecting deposit cans and bottles from the garbage cans. The man looks to be 80 years old and he drives a recent model midsize Japanese car. I wonder why a person who can afford a relatively new car has to spend mornings collecting cans. I mean, it's certainly more efficient here in suburbia to use a car rather than a shopping cart, but it still makes me sad to think of being that old and having to do that. Nonetheless, the folks who brought Janus envision that as the future for all of us. They want fewer dues-payers and then they'll target collective bargaining. Trump's lunatic Supreme Court will deny working people anything they can. Next they'll go for pensions and we'll all be collecting aluminum cans, because that's how you Make America Great Again. I remember the first day I woke up and saw that Donald Trump was going to be President of the United States. I thought he'd be the worst President ever, but I also thought that about GW. Trump makes GW look relatively tame, and that's a tough thing to do. But if there was someone worse than GW, there's also someone worse than Trump. It might be Pence, and we might find out after we impeach Trump. I hope I get better, and I hope the weather gets better. Here's a word to the wise--Don't eat the gas station sushi, and in November, don't vote for it either.